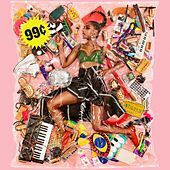 Santigold, nee Santi White, has quite the curriculum vitae. Born and raised in Philadelphia, but based out of Bed-Stuy, Brooklyn, she was an African-drum-playing music major at Wesleyan University, a Sony A&R underling, and ska-punk band Stiffed's leading lady before evolving into an avant-garde mash-up artist and critical darling. And even though she's spent the majority of her career in the deep underground, she's definitely got some friends in high places: she's toured with friend and artistic peer M.I.A. ; opened for Bjork; worked with Spank Rock; penned and produced for R&B siren Res; and has written for the GZA, Lily Allen and Ashlee Simpson. Master craftsmen like Mark Ronson, Switch, Diplo, Jon Hill (her partner in Stiffed) and the late Disco D produced her self-titled debut album. 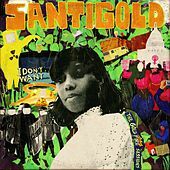 Santogold, which reflects influences like Bad Brains, Tina Turner, Devo, the Smiths, Cocteau Twins and many more, is a stunning display of hipster pastiche -- it's ear candy loaded with brain food of a subversive flavor.